This paper reports on the findings of a study pertaining to the psychological impact of e-learning on social network sites. The findings have resulted by means of a correlational analysis between attitude towards e-learning on social network sites and satisfaction with life of students experienced with e-learning experiences. It was based on an online survey of 607 valid responses with e-learning experiences gathered from 896 online respondents. The gender profile was balanced (males 50.7% and females 49.3% respectively). 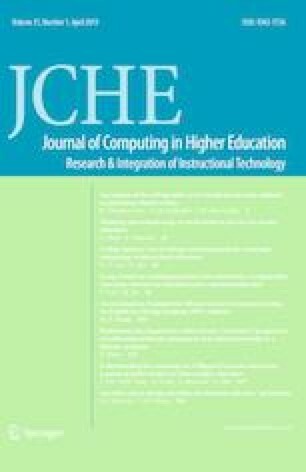 The analysis found that students who had experience of e-learning on social network sites also had a positive score on the Satisfaction with Life Scale (females 4.40 out of 6, SD = 0.91 and males 4.38 out of 6, SD = 0.9). The attitudes towards e-learning were also positive (female 4.34 out of 6, SD = 1.0 and male 4.12 out of 6, SD = 1.2). The relationship between e-learning attitudes and satisfaction with life was investigated using the Spearman Rank Order Correlation (rho) statistic. The research data shows a significant positive association between attitudes towards e-learning and satisfaction with life by females and males. Andale. (2014). Cronbach’s alpha: Simple definition, use and interpretation. Retrieved October 7, 2017, from http://www.statisticshowto.com/cronbachs-alpha-spss/. Accessed 11 Jan 2019. Bersin, J. (2017). The disruption of digital learning: Ten things we have learned. Retrieved October 20, 2017, from https://joshbersin.com/2017/03/the-disruption-of-digital-learning-ten-things-we-have-learned/. Accessed 11 Jan 2019. Davies, S. (2010). Effective assessment in a digital age a guide to technology-enhanced assessment and feedback (JISC e-Learning Programme) (p. 64). United Kingdom: Higher Education Funding Council for England (HEFCE), Joint Information Systems Committee (JISC) e-Learning Programme. Retrieved from https://facultyinnovate.utexas.edu/sites/default/files/digiassass_eada.pdf. Accessed 11 Jan 2019. GfK Bluemoon, & Australian Communications and Media Authority. (2013). Like, post, share: Young Australians’ experience of social media Quantitative research report. Australia: The Australian Communications and Media Authority. Retrieved from http://www.acma.gov.au/theACMA/Library/researchacma/Research-reports/young-australians-and-social-media. Accessed 11 Jan 2019. Gordon, K. (2017a). Global social media ranking 2017 | statistic. Retrieved October 25, 2017, from https://www.statista.com/statistics/272014/global-social-networks-ranked-by-number-of-users/. Accessed 11 Jan 2019. Gordon, K. (2017b). Social media statistics. Retrieved October 25, 2017, from https://www.statista.com/topics/1164/social-networks/. Accessed 11 Jan 2019. Hampton, K., Rainie, L., Lu, W., Shin, I., & Purcell, K. (2015). Social media and the cost of caring. Retrieved May 13, 2015, from http://www.pewinternet.org/2015/01/15/social-media-and-stress/. Accessed 11 Jan 2019. Laerd Statistics. (2018). Spearman’s rank order correlation using SPSS statistics: A how-to statistical guide. Retrieved December 2, 2018, from https://statistics.laerd.com/spss-tutorials/spearmans-rank-order-correlation-using-spss-statistics.php. Accessed 11 Jan 2019. Merriam-Webster. (2017a). Definition of social media. Retrieved October 31, 2017, from https://www.merriam-webster.com/dictionary/social%20media. Accessed 11 Jan 2019. Merriam-Webster. (2017b). Definition of social network. Retrieved October 31, 2017, from https://www.merriam-webster.com/dictionary/social+network. Accessed 11 Jan 2019. Mitra, S. (2013). The internet can harm, but can also be a child’s best tool for learning | Sugata Mitra. The Guardian. Retrieved from https://www.theguardian.com/commentisfree/2013/nov/03/child-safety-internet-web-access. Noyes, D. (2017). Top 20 Facebook statistics: Updated October 2017 [Marketing research]. Retrieved October 20, 2017, from https://zephoria.com/top-15-valuable-facebook-statistics/. Accessed 11 Jan 2019. Obizmedia. (2013). The use of social media in school infographic. Retrieved October 20, 2017, from https://elearninginfographics.com/the-use-of-social-media-in-school-infographic/. Accessed 11 Jan 2019. Omar, A. (2017). Tailoring quality assurance towards education 4.0. Retrieved from http://www.utar.edu.my/sieqa2017/file/Website/Seminar/Plenary.pdf. Accessed 11 Jan 2019. Pew Research Center. (2018). Social media use 2018: Demographics and statistics. Retrieved December 12, 2018, from http://www.pewinternet.org/2018/03/01/social-media-use-in-2018/. Accessed 11 Jan 2019. Schauer, P. (2015). 5 Biggest differences between social media and social networking. Retrieved October 25, 2017, from http://www.socialmediatoday.com/social-business/peteschauer/2015-06-28/5-biggest-differences-between-social-media-and-social. Accessed 11 Jan 2019. Singh, M., Goel, D., & Islamia, M. J. (2016). Impact of students attitudes towards social media use in education on their academic performance. AIMA Journal of Management & Research, 10(2/4). Retrieved from http://apps.aima.in/ejournal_new/articlesPDF/Divya-Mitushi.pdf. Accessed 11 Jan 2019. Uvalić-Trumbić, S., & Daniel, J. (2013). A guide to quality in online learning (p. 28). Academic Partnerships. Retrieved from https://www.chea.org/userfiles/uploads/A%20Guide%20to%20Quality%20in%20Online%20Learning.pdf. Accessed 11 Jan 2019. Vate-U-Lan, P. (2017b). The Oxymoron of serious games in eLearning: Gender differences from an internet-based survey in Thailand. In International academic conference on teaching, learning and e-learning in Budapest Hungary 2017 (IAC-TLEl 2017) (pp. 6–17). Budapest, Hungary: Czech Technical University in Prague. Retrieved from https://www.slideshare.net/drpoonsri/the-oxymoron-of-serious-games-in-elearning-gender-differences-from-an-internetbased-survey-in-thailand. Accessed 11 Jan 2019. Vate-U-Lan, P., & Masouras, P. (2018). Thriving social network for communication on elearning: Exploring gender differences in attitudes. In Proceedings of the first international conference on data science, e-learning and information systems (p. 14). Ayre Gran Hotel Colón, Madrid, Spain: ACM. https://doi.org/10.1145/3279996.3280010. World Health Organization. (2013). Comprehensive mental health action plan 2013–2020 (Annex No. WHA66.8). Geneva: The Sixty-sixth World Health Assembly. Retrieved from http://apps.who.int/gb/ebwha/pdf_files/wha66/a66_r8-en.pdf. Accessed 11 Jan 2019.